“We know that Christ, raised from the dead, dies no more; death no longer has power over him” (Romans 6:9). From the beginning of Christianity, his followers have proclaimed, “Christ is Risen!” and have thereby announced the end of the kingdom of death and the inauguration of the new People of Life, called to embrace all humanity into one family. The Church, called to invite and lead all people to salvation in Christ, proclaims and opens the door to that life which is eternal. The gift of eternal life, however, presupposes the natural gift of human life itself. In our day, this most basic good and most fundamental right is under unprecedented attack, particularly by abortion, which claims the most defenseless human victims, and in greater numbers than any other form of violence. It is the defense of the natural right to life that gives rise to the work of this organization. The People of Life understand that the command to “love one another” knows of no exceptions, and that no Christian can be indifferent to attacks on human life. Nourished by the Biblical call to rescue the vulnerable and defend the defenseless, many have committed themselves to defend the lives of the poorest of the poor – the unborn – and of others whose very right to life is denied. Many, moreover, feel called by God to do this work of justice on a full-time basis. “Where life is involved, the service of charity must be profoundly consistent. It cannot tolerate bias and discrimination, for human life is sacred and inviolable at every stage and in every situation; it is an indivisible good” (EV, n.87). It is precisely that consistency that calls for a new Culture of Life, in which the unborn child is treated with the same care and protection as the born. Consistency, properly understood, recognizes that some rights are more fundamental than others, and that life itself is the condition for all the rest. We seek to serve and protect the unborn, and to be a collective and visible voice for the voiceless millions who have been killed or are in danger of being killed by abortion. We call for the establishment of full recognition of their rights and protection of their lives. We do this fully realizing that without such recognition and protection, every noble effort to establish justice in the human community is undermined, every affirmation of human dignity is contradicted, and peace between families, communities and nations is threatened. As Pope Saint John Paul II declared in Christifideles Laici, “…[T]he common outcry, which is justly made on behalf of human rights -- for example, the right to health, to home, to work, to family, to culture -- is false and illusory if the right to life, the most basic and fundamental right and the condition of all other personal rights, is not defended with maximum determination” (n.38) and as St. Teresa of Calcutta said, “The greatest destroyer of peace today is abortion” (Speech to National Prayer Breakfast, Washington DC, February 3, 1994). It stands to reason, then, that there will clergy and laity alike who will want to devote themselves to the great task of restoring recognition of the right to life where it is directly denied. This is a response to the call issued in Evangelium Vitae: “What is urgently called for is a general mobilization of consciences and a united ethical effort to activate a great campaign in support of life. All together, we must build a new culture of life” (EV, n.95). Because the theme of “life” is so fundamental, it is also very broad, and is therefore subject to the possibility of becoming diluted or over-extended. The Missionaries of the Gospel of Life are always to maintain a clear focus on the defense of the unborn. We understand and present the defense of the unborn and the vulnerable in the context of justice. Missionaries will be eager, in their presentations and in their work, to overcome the false division between “social justice” work and “right to life” work, ever mindful that the right to life is the core of social justice and impels the whole Church toward works of social justice. We foster esteem and active collaboration with other right to life organizations and with social justice ministries both within and outside the Church. As a program of Priests for Life, the Missionaries of the Gospel of Life share its vision and goals. We seek to give witness before the Church and the world to the priority of the right to life as the foundation of all other rights, and to the absolute claims to respect and protection that this right makes upon every individual and community in the human family. To serve the entire pro-life movement by offering spiritual support, guidance, teaching and direction. In short, we serve the unborn child and the pro-life movement. Because cultures and their laws change, the particular shape of the attacks on the right to life will change from generation to generation. However, as long as humanity exists, its youngest, most vulnerable members will always need care and protection, and those who bring them to birth will always need courage. Moreover, the Gospel of Christ will always be the Gospel of Life, and as direct attacks on the right to life take various forms throughout history, believers will always bear witness to the Gospel and summon others to respond to its demands as the needs of the time require. These goals are accomplished by our presence in local communities to strengthen the work of the Church as it relates to the right to life, to serve the pro-life movement, and to reach out to the wider community by means of media and other forms of public outreach. The Missionaries of the Gospel of Life participate in four overarching spiritual disciplines as they live out their commitment. These disciplines are prayer, study, fellowship, and apostolic witness. The priests of Priests for Life participate in the various activities outlined below, often together with lay Missionaries of the Gospel of Life, in response to invitations they receive from dioceses, parishes, and pro-life organizations. Parish visits – At the invitation of the local pastor, we visit parishes to preach the pro-life message at Masses, parish missions, or other parish gatherings in liturgical or educational settings. We meet with, train and strengthen local parish ministers in the pro-life dimensions of their work. Assistance to clergy – We provide spiritual and practical assistance to the clergy of all denominations in the pro-life dimensions of their ministry. Training seminars – We present training seminars about all aspects of the pro-life movement to priests, deacons, seminarians, laity, and ecumenical audiences. Retreats – We offer pro-life retreats, which give participants an opportunity to see in their relationship with God the call to defend life, and to root all their pro-life activities in their relationship with God. Presence at ministerial conferences – We are present, as members, participants, and exhibitors, at conferences at which specialists in different aspects of Church life and ministry gather. Our presence provides pro-life resources, networking and education to them. Pro-life events – We participate in the events of local, national, and international pro-life organizations and Churches. We are invited to speak and pray at their conventions, banquets, seminars, prayer vigils, and abortion mill protests, to strategize with or minister to their members, and to provide a clerical presence where it is lacking. Alternatives to Abortion and Healing After Abortion – We foster, promote, and interact with the many ministries, both within and beyond the Catholic Church, that provide alternatives to abortion and healing after abortion. We assist the Churches to connect their congregations with such resources. Our priests assist directly in training and carrying out counseling both before and after abortion, and in conducting retreats for those wounded by abortion, including all the family members of the aborted child. We also minister to medical personnel and their assistants who previously performed the abortion procedure and have repented. Media activity – We produce and appear on radio and television broadcasts for local, national, and international media outlets to articulate the pro-life message and comment upon developments relevant to it. Fostering political responsibility – Through non-partisan activities, we assist Churches and pro-life organizations to mobilize, equip, and educate their people to carry out their political responsibilities. This includes such activities as voter registration, distribution of non-partisan voter guides, and get-out-the-vote drives. Schools – We speak at schools of every level to deliver the pro-life message to students and to equip and encourage the faculty and administration in this dimension of their work. Participation in leaders’ meetings – On a local, national, and international level, we participate in various meetings with leaders of all religious, political, and cultural backgrounds to develop strategy for the pro-life movement. Individual counseling of members in government, media, and other leadership roles – We hold personal and confidential meetings with leaders to discuss their attitudes and actions regarding the right to life, and provide important opportunities for conversion, guidance, and encouragement. Dialogue – We foster respectful dialogue with those who promote the Culture of Death, in such a way that, without compromising our message, we can enable them to realize that they too share in the dignity proper to every human life. By rediscovering their own dignity, they may be able to rediscover that of the unborn child. We also promote that dialogue of salvation which the Church carries out with all who do not embrace the Christian faith or any faith at all. Many people of good will share our concern about the right to life, and we collaborate actively with them in its defense. A pro-life spirituality pays special attention to the ways in which the seasons and feasts of the Church calendar shed light on and strengthen our commitment to the sanctity of human life. There are certain liturgical days which are particularly suited to our focus on the centrality of the gift of life, and its special commitment to the unborn. We assist others to study the meaning of these feasts and celebrate them in their local communities with a pro-life focus. Easter, the primary feast day for the entire Church, is especially appropriate as the primary feast day, because it is the Day of the Victory of Life. The Annunciation (March 25) is the feast on which God became an unborn child, thus sanctifying all life in the womb as he sanctified it at every stage. In the same manner, we celebrate Christmas with a deep awareness that it is the feast of the Incarnation, and therefore inherently proclaims the truth of the sanctity of all human life. The Immaculate Conception (December 8) likewise carries the clear message of God’s relationship with human life at its earliest stages. The Holy Family is celebrated shortly after Christmas. The family is the sanctuary of life, and we draw from this feast a renewed commitment to defend and promote strong families. St. Joseph (March 19), the “Just Man,” who had the role of protecting the Holy Family, embodies the example for all fathers to follow. The lack of willingness of the father of an unborn child is frequently the cause of abortion. Honoring St. Joseph and teaching the faithful his example can inspire men to carry out their proper role in defending life. The Holy Innocents are honored every December 28, and many pro-life activists will mark this day with special memorials to the countless innocents slain by abortion. Our Lady of Guadalupe, whose image brought about an end to the practice of human sacrifice among the Aztecs, is the Patroness of the Unborn. On her feast day, December 12, we commend to her care all unborn children and those who defend them. April 28 – St. Gianna Beretta Molla, who gave her life for her unborn child. Patron of Mothers and Physicians. October 5 – St. Mary Faustina Kowalska, Patron Saint of Mercy, who was given the Chaplet of Divine Mercy to pray in particular in reparation for abortion. October 16 – St. Gerard Majella, Patron Saint of Pregnant Mothers and of Childbirth. In the recitation of the Chaplet of Divine Mercy, pro-lifers should keep in mind the historical and intrinsic connection between this devotion and the need to invoke God’s mercy for the sin of abortion, as revealed in the Diary of St. Faustina. It is also helpful to keep in mind the special Apostolic Blessing of Pope St. John Paul II for those who say the chaplet for this particular intention. In their daily prayers and Masses, members should keep in their intentions the benefactors of Priests for Life and the many prayer intentions that are sent in from the general public, especially those related to women tempted to abort, to families who have lost children to abortion, and to aborted babies themselves. Our priests offer Mass regularly for the intention of an end to abortion and euthanasia, as well as for all our Missionaries and others who collaborate with us. The teachings that shape our life and mission come above all from the Word of God as found in Scripture and Tradition, and safeguarded and taught by the Magisterium of the Church. Among the documents of the Magisterium, we give primary emphasis to Pope Saint John Paul II’s encyclical Evangelium Vitae (The Gospel of Life), for which we are named. We see Pope Saint John Paul II as the Pope of Life, and his encyclical, as well as the witness of his life, lay out the contours of our mission and spirituality. The teachings and example of St. Teresa of Calcutta, a strong voice for the unborn and vulnerable, are a special source of instruction and inspiration for us. In her meetings with Fr. Frank Pavone, Mother Teresa provided personal input and encouragement to the work of Priests for Life. We also study and promote the educational materials provided by Fr. Frank Pavone and his pastoral team. We gather for our library all materials published on the topic of abortion by those who oppose it and by those who support it, and study this material. We also gather and make available to the public any pro-life statements by bishops’ conferences or individual bishops anywhere in the world. The training in pro-life spirituality of the Missionaries of the Gospel of Life does not exclude a person from pursuing other training programs in spirituality, nor from joining various types of associations in which they would make other commitments, provided they do not contradict the pro-life stance. 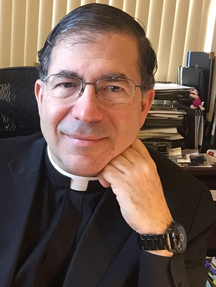 Priests for Life and the Missionaries of the Gospel of Life do not seek to replace existing structures in the Church or the wider society that are engaged in the pro-life mission, but rather to infuse them with renewed vigor and effectiveness. Where it is appropriate, we will assist in the building of local efforts and the training of those who carry out those efforts. There are many priests, deacons and laity in the Church who do pro-life work. Our mission is neither to take their work from them nor to claim that we do it better, but rather to encourage them in that work and help it to flourish. For us, however, pro-life work is not merely an assignment or one aspect of apostolic work. It is, rather, a vocation within a vocation. And we live it out in unity with all those committed to the same mission around the nation and throughout the world. We carry out our work in collaboration with local dioceses, pro-life leaders, organizations of all kinds, Christians of other denominations, believers of non-Christian religions, and all people of good will. We provide to local efforts a national perspective, and the benefit of our experience in developing strategies and networking with all the existing resources of the pro-life movement. We bring these new resources to local communities and organizations, so that a fruitful process of dialogue, mutual learning and encouragement, and growth in effectiveness may occur. Once the program of study and training in the teachings and practices of this pro-life spirituality are completed, and the individual wants to commit him or herself to living it, that commitment is expressed publicly. Doing so emphasizes the "fellowship" dimension of this spirituality, in which the Missionary is committed to public witness to life and also seeks and receives the encouragement of the wider community of believers and the pro-life movement. The commitment can be carried out at a public Mass, with the appropriate permission of the pastor, or in a more private -- though communal -- setting. -- union with others who live the same spirituality, and with the wider pro-life movement.